We help SoftPro users stand out during the closing process. 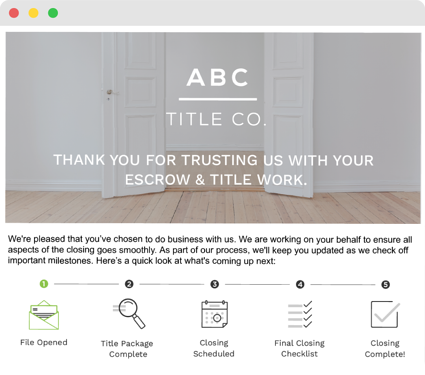 Send automated Text Messages, beautiful Emails, & the Pizza Tracker for Title™ to help drive your business forward & save time (60-90 min / file). Push all of your updates directly to your customer through emails and texts, meaning they don't have to go anywhere (i.e. to a portal) to know exactly where things are at. Integration with SoftPro means zero double data entry, and a seamless transition from SoftPro to CloseSimple. On-boarding typically takes less than one month, and we help you design all of your content, including branded assets & timelines. 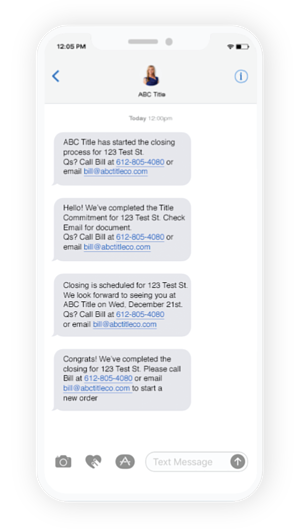 Sending text message updates to your Realtor and consumer customers takes the closing experience to the next level and differentiates you in a sea of sameness. You control what your text messages say, and if you choose a manual delivery process you can even edit them prior to sending. You can take advantage of our integration with Zipwhip to text enable your office number, meaning when your customers see you coming through their phone, they know you're moving the file forward. The Pizza Tracker for Title™. The pizza tracker delivers peace of mind to your customers, cutting down on phone calls & inquiries to you and/or your staff. Each milestone is customized to your process and we'll work with you to ensure you have the rights steps in your custom tracker. Contact us to chat about bringing CloseSimple to your SoftPro.